Brazil and Mexico played to a thrilling goalless draw. Mexico deserved their point against a slow, ponderous Brazil side who were left cursing their luck as Guillermo Ochoa put on a goalkeeping masterclass. The match began at a frantic pace, with both sides going in with full-blooded challenges. Brazil nearly took the lead within 10 minutes. Marcelo fed Oscar down the left, the Chelsea playmaker crossed for Fred who could only find the side netting with his effort – although it would not have counted as the assistant referee raised his flag for offside. Mexico grew into the game in the middle of the half, with Oribe Peralta causing the Brazilian backline some problems before Porto midfielder Herrera saw his fierce long-range drive go narrowly over. Brazil attacked and forced the first real save from Ochoa—Neymar was the man to be denied. The Barcelona striker got above Marquez at the back post from a floated free-kick from the right. 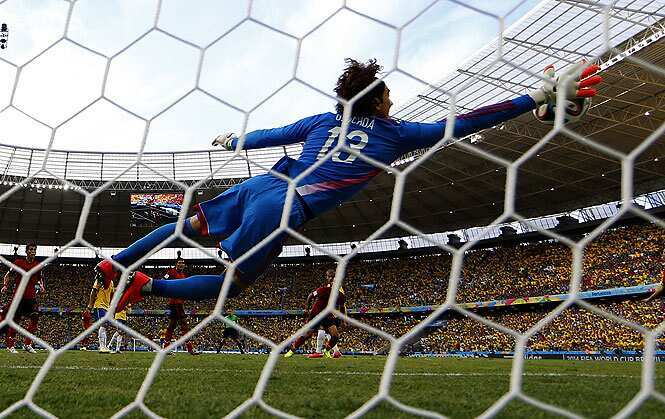 Ochoa made an outstanding one-handed save to frustrate the Brazilian fans. Despite Brazil having the lion’s share of possession and Mexico looking to soak up the pressure and fast counter, Vazquez almost gave them the half-time lead. Guardado left Dani Alves for dead before cutting the ball back. Vazquez’s effort had Julio Cesar scrambling as it flew wide. Ochoa had to be at his best to keep the scoreline level going into the break. Neymar whipped in a free-kick from the left that was headed down to Paulinho, but he was denied by Ochoa who spread himself very well. Scolari replaced Ramires with Bernard, the diminutive Shakhtar man almost made an instant impact. He raced down the right and fired in a cross that Rodriguez had to head behind for a corner as Neymar lurked behind him. Mexico showed some attacking strength of their own, going close with two long-range efforts within a few minutes of each other. The first was Andres Guardado’s left-footed drive, which was deflected over via the head of Thiago Silva, before Vazquez had another thunderbolt go just over the bar. Playing some great stuff, Mexico came forward again— this time it was Herrera who went close from range. Mexico bossed the game in spells, which had the fans in the stadium booing. However, Ochoa was forced down low to deny Neymar again after a Bernard cross. In the later stages, the game began to get stretched, with both sides getting in behind. Jo screwed his shot just wide after being played through by Bernard – the ex-Man City man ought to have hit the target. Five minutes from time, man-of-the-match Ochoa majestically saved a point-blank Thiago Silva header from Neymar’s free-kick. It began to look like Brazil were going to steal the win. Moments later, Marcelo went down under a challenge from Raul Jimenez but the referee waved his penalty claims away. Brazil went from almost getting a penalty to almost conceding late, as Guardado whipped in a late shot. Mexico nearly triumphed. Brazil has Julio Cesar’s strong wrists to thank for denying Raul Jimenez’s powerful drive. Brazil will play Cameroon in the last match, but they must up their game if they are to win the tournament. Mexico’s last group game is against Croatia as El Tri look to go to the second round. BRAZIL: Julio César, Alves, Silva, Luiz, Marcelo, Paulinho, Oscar (Willian 84), Ramires (Bernard 46), Luiz Gustavo, Fred (Jo 68), Neymar. BOOKINGS: Ramires 45, Thiago Silva 79. MEXICO: Ochoa, Rodríguez, Márquez, Herrera (Fabian 76), Layún, Dos Santos (Jimenez 84), Moreno, Guardado, Peralta (Hernandez 74), Aguilar, Vázquez. BOOKINGS: Aguilar 59, Vazquez 62.